The flights of two Mi-24 combat helicopters of Armenia’s armed forces on Nov. 12 and an analysis of completed tasks once again confirm the initial findings, the Azerbaijani Defense Ministry said Nov. 18. An animated event model, prepared with reference to the opinions of experts in military aircraft and operational intelligence data, clearly shows that the helicopters’ crews, following combat instructions, were executing a task to strike the Azerbaijani army positions on the front line. “After completion of this task, that is, after shelling our positions, the enemy helicopters, manoeuvring and covering each other, began to leave the zone of fire,” the ministry said. 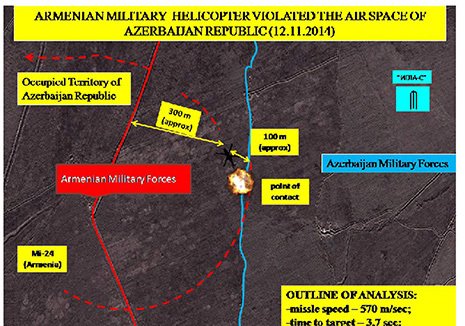 Taking into account that the Armenian side is manipulating the information on the incident, and given the fact that flights over Azerbaijan’s occupied territories are banned, and uncoordinated flights over these territories are considered as a violation of Azerbaijan’s airspace, the ministry stated that the enemy helicopter that opened fire on Azerbaijani positions, was destroyed by a retaliatory fire. An Armenian Mi-24 military helicopter flying 1700 meters northeast of the Kengerli village of Azerbaijan’s Aghdam district attacked the Azerbaijani army positions on Nov. 12. The helicopter was shot down by the Azerbaijani side. As a result of the ensuing war, in 1992 Armenian armed forces occupied 20 percent of Azerbaijan, including the Nagorno-Karabakh region and seven surrounding districts. The two countries signed a ceasefire agreement in 1994. The co-chairs of the OSCE Minsk Group, Russia, France and the US are currently holding peace negotiations. Armenia has not yet implemented four UN Security Council resolutions on the liberation of the Nagorno-Karabakh and the surrounding regions.